Megulla 2x16.4ft LED Strip Light Pro Kit contains everything you need to complete your LED strip light installation. You no longer have to measure, plan and worry - just pick an appropriate kit and you're ready to go! Each roll is backed with 3M adhesive tape: No-hassle installation. LED strip is cuttable with scissors: Use any length you need. Backed by a one-year warranty from Megulla for peace of mind. 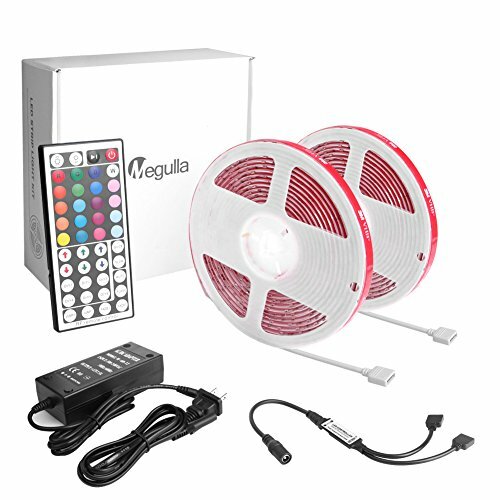 EVERYTHING YOU NEED including a 44 key remote with custom color options, a compact 12V DC power supply transformer, a selection of connectors, and 2 rolls of HIGH OUTPUT RGB LED strip light featuring Megulla SMD 5050 LED chips and a weatherproof silicone coating. VERSATILE LED STRIPS can be installed just about anywhere, including kitchen cabinets, bedrooms, recessed coves or crown moldings. Even outdoors on decks and patios! ENDLESS POSSIBILITIES. Use your color-changing kit on your PC, TV, or media center - in your kitchen, bedroom, or bathroom - even outdoors, on a deck, patio, or barbecue area. The only limit is your imagination! MEGULLA QUALITY. Backed by a one year warranty from Megulla for peace of mind. Contact our customer service team at any time for no-hassle troubleshooting and replacement or for any questions about purchasing or installation.